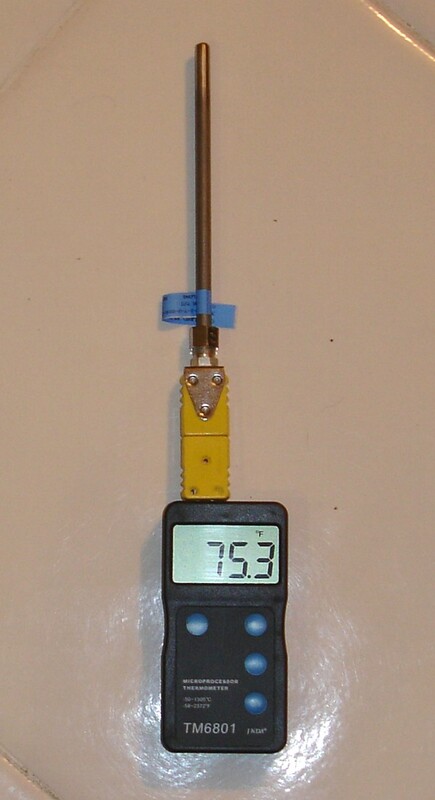 Pyrometer and a 5/16 inch diameter MGO type K temperature probe Thermocouple that can be used for measuring the temperature of reduction atmospheres up to 1300 °C or 2350°F. It also has a 0.1 degree high resolution mode for low temperature applications. The display in either Celsius or Fahrenheit temperatures. Units has simple pushbutton use and easy to read large LED display. The meter is powered by one 9V battery (included). Four digits, 0.8" (20 mm) large LCD display. Display in either °C or °F. Display range: For 1 degree resolution: -50-1300 °C,-58-2373 °F. Over range display: Hi or Lo. Storage condition: 0-50°C (32-122°F), <80%RH. Battery type: 9V battery life: 300 hr for alkaline battery. 150hr for heavy duty battery. Accuracy: +/- 0.5% of full scale + 1 digit. Transition style MGO with Inconel 600 body. Working temperature range -50-1300°C, -58-2373°F. We are Fallonator™, if you still want something different we will get it for you. Want a probe length of 24” or a 25 foot flex cable to run to another room? This is what we do, can we do something for you.